One of my favorite things to do on vacation is go on long walks on the beach. Anyone else? The landscape is breathtaking and so is the workout (hello, calves!). On my second day in Cabo, my friend Lauren and I went on a really long walk. We took these photos after breakfast at the hotel (we stayed at the Hilton Los Cabos and it is incredible) and got the best light! It was bright, but not so much that it bleached out the gorgeous blue sky. 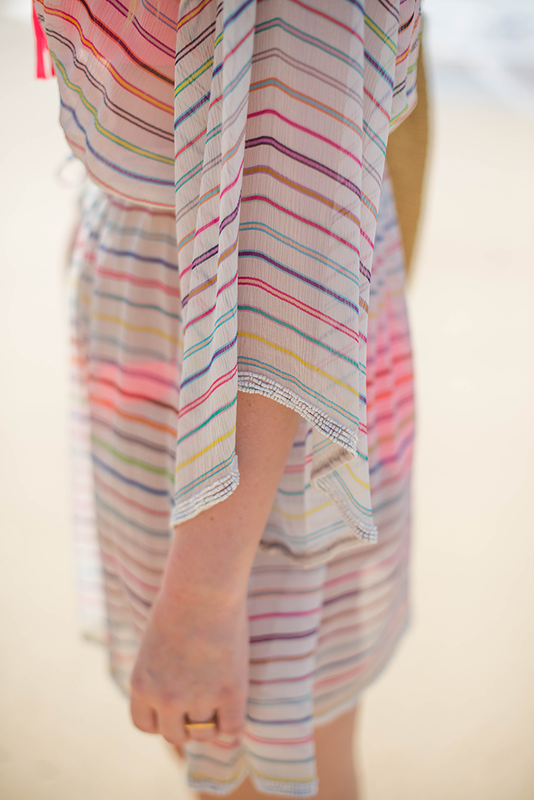 I wore my pretty new cover-up from Calypso – I’m head over heels for the multi-colored stripes and beaded details. My pink-framed Fendi shades couldn’t be a better match for it too! While I never did go surfing on this trip, I did wear my Old Navy rash guard to protect myself from getting more sunburned. 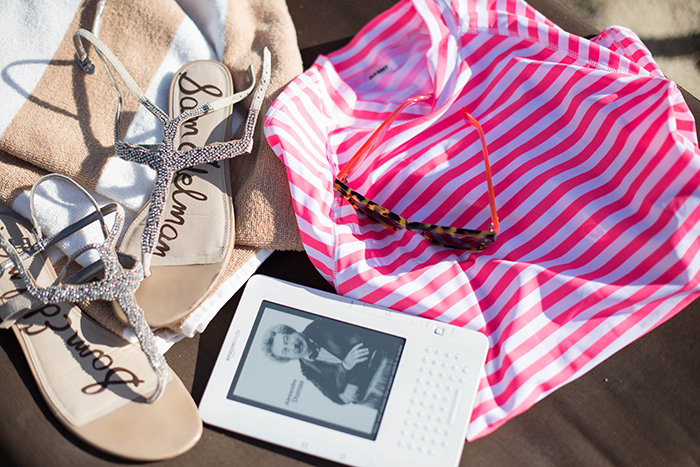 What are some of your favorite beach essentials? On Friday I’ll be sharing more of mine! On another note, a week from today I’ll be flying out to the big apple for a full two weeks! I’m looking forward to shopping, catching up with friends and eating my way through the city. If you have any new restaurant recommendations, comment below and let me know! What a fabulous cover up! And this neon fringe bikini…..LOVE! This cover-up is too cute, have fun in NYC I just love that city. Remember to link-up with Charnele and I today! 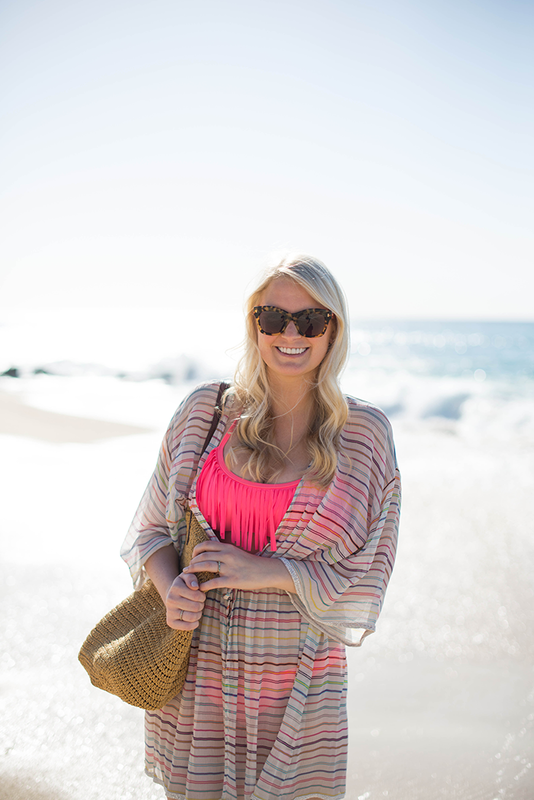 Love your cover up and sunnies! Love that coverup! I have to buy it for my upcoming Mexico trip… Thanks for sharing!! You look wonderful as always. I always eat at Tao when in New York. I’ve been way too many times, but it’s always good. It’s not even fair how gorgeous you are. That and the location just looks so incredible! Amazing photos! They are so gorgeous. Great blog! obsessed with this post! I love the bright refreshing vibe, and the perfect way your look came together. Love your rings. I snagged one of those fringe bikini tops from Target too. Great minds think alike:) Now I’m just hoping it holds up…I’ve never purchased swimwear from Target. Enjoy the rest of your vaca, pretty lady! Have to admit I’m pretty jealous! Gorgeous! The perfect cover up! Love the stripes and your straw tote! Be sure to head over to the Met when you’re in NY to check out the Costume Institute’s collection and then head upstairs to the rooftop garden cafe where you can sip cocktails and check out the amazing views of Central Park and the upper east side. So worth it! I love this cover up! And you! Looking good and making me wish I was in Mexico! Love the bikini top & straw bag!!! I love that cover up and the colors look great on you! NYC is so much fun! A few of my favorites include the Spotted Pig for a great burger, Ippudo for amazing ramen, and of course Laudree for macroons. Have an amazing trip! 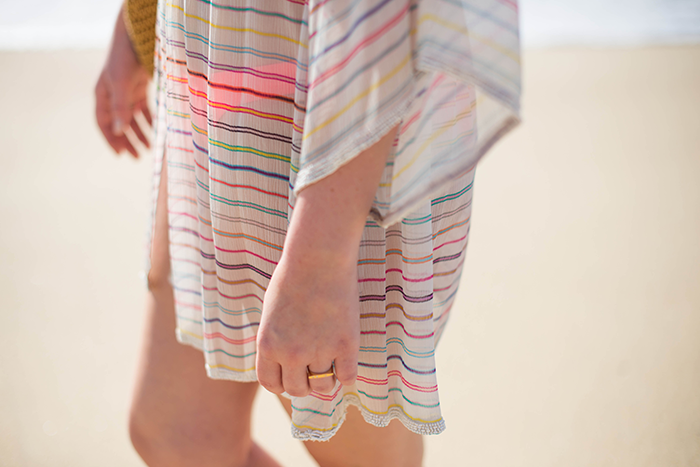 Love that colorful coverup! I can’t wait to get to the beach this summer. Definitely have some restaurant recos, and would love to grab a drink or coffee while you’re here! Will drop you a note later today. Gorgeous cover up… these photos are beautiful! Great cover up! I can’t wait to get on the beach myself! LOVE your cover up and these photos are gorgeous! I want to be on a beach!! These pictures are incredible and the cover up looks great! So excited for you to get here!! gorgeous! you are making me want to go to the beach asap! What a great beach look on you. Calypso makes the BEST cover ups! It looks amazing on you!!! Those Sam Edelman are perfection for a beach vacay!!! Good luck packing for NYC!!! =) Hope you have a great week!! Nice beach ensemble…love the cover up and the color of your swimsuit. The beach is gorge! what a perfect day!! love your bikini and the tunic! so chic! the photos are beautiful! Oh I would just love to be en la playa right now! So beautiful, I love the cover up and swimsuit. I love your bathing suit, and that cover-up is super cute! It looks like you had a lot of fun on your trip. The beach looks beautiful. Stunning beach look! Loving that cover-up! So so cute loving your coverup! Such a cute cover up. And what gorgeous scenery. I am dying to go to the beach! how blissful is this omg! Such beautiful photos. PS – love the coverup! so pretty! love your look! MERRITT! You look EXTRA gorgeous in these photos. Love everything about them!!!! !